Why, when most perfumes go out of fashion or quietly die away, has Chanel No. 5 consistently ranked as one of the top selling perfumes for decades? What’s fascinating about Tilar J. Mazzeo’s attempt to answer this question in The Secret of Chanel No. 5: The Intimate History of the World's Most Famous Perfume is that although she dispels certain myths and replaces them with facts (or more myths, depending on who you ask) about the history of Chanel No. 5, she suggests that Chanel No. 5’s true secret is that it has the elusive quality all cult brands have: it acquired a life of its own in the minds of those who loved it. The book is divided into three parts — “Coco Before Chanel No. 5,” “Love and War,” and “The Life of an Icon.” By teasing out the complex history of the characters involved in Chanel No. 5's creation, to describing the post WW II milieu in which its brand was solidified, Mazzeo has us think of the perfume in richer terms than I would have thought possible. In the first section, Mazzeo explains how Gabrielle “Coco” Chanel’s biography holds clues about Chanel No. 5. We hear about her humble beginnings as a charity-case orphan, her days as a showgirl and then kept woman, and her ultimate rise to high society, culminating in her position as a fashion designer. Chanel No. 5’s aesthetic, and the perfume's dialectic between clean and dirty, Mazzeo speculates, came from Gabrielle "Coco" Chanel's early experiences. In the Aubazine convent where the charity-case orphan was raised, "the aroma of sheets boiled in copper pots sweetened with dried root of iris and the aroma of ironing" contributed to Coco's love of clean smells and minimalist aesthetics. The number five was interwoven into the convent's occult beginnings. "Cistercian cathedrals, churches, and abbeys," as she quotes one scholar, " are built on..."the Golden Ration of Pythagoras," which is "the ratio of both the five-pointed star and the human form." As a result, the number 5 became Coco Chanel's lucky number. These interpretations are so tantalizing that I found myself accepting them uncritically, but the reader should remind herself that Mazzeo is reading a lot into, for example, the austerity of Aubazine's architecture and its eventual influence on a perfume! When Coco Chanel left the convent and became a showgirl, she met a kept woman named Émilienne who was part of the demi-monde to which Coco belonged. Her personal scent deconstructed the prevailing scent code of good girl/bad girl and, Mazzeo argues, influenced the character of Chanel No. 5. 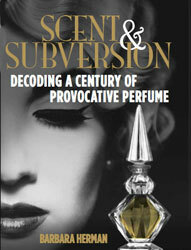 At the start of the century, Mazzeo tells us, there were certain perfumes that either said "courtesan" or "nice girl." Jasmine, musk, patchouli, tuberose, and animalic scents, for example, were worn by openly sexual women who might as well be prostitutes; good girls wore "delicate floral scents of rose or violets." But when Coco met Émilienne, she loved that the worldly woman didn't smell of musk and jasmine. Instead, Émilienne smelled both "clean and sensual," a combination of "warm skin and freshly washed hair." This would contribute to Chanel No. 5's dichotomy of clean aldehydes and musky, indolic sexuality, making it a more modern take on the expression of sexuality in perfume. Because of Chanel's relationship with an exiled Russian duke/cousin to Russia's last czar Nicholas II, Dmitri Pavlovich, Chanel was able to meet perfumer Ernest Beaux, whose formula for Chanel No. 5 may have existed previously in imperial Russia under the name Rallet No. 1. Beaux has revealed that his use of aldehydes in Chanel No. 5 was sought to evoke the scent of snow and lichen in the Arctic where he was stationed during the last years of WW I. Although Chanel No. 5 was not the first to deploy aldehydes in perfume, its use as a counterpoint to Chanel No. 5’s sensual jasmine and rose made it a modern landmark. Much of this happened against Coco Chanel’s wishes. To Mazzeo’s credit, The Secret of Chanel No. 5 is no Coco Chanel hagiography; to put it mildly, Coco doesn’t exactly come across as a saint or likeable person. While her Jewish business partners were attempting to distribute Chanel No. 5 through the US Army as a tax-free product to be sold in military commissaries around the world, Coco was attempting to use anti-Semitism to get control back from these business partners at the same time that she was consorting with Nazi sympathizers. Oy. Vey. Mass marketing of Chanel No. 5 didn’t destroy the prestige of the fragrance. Instead, it transformed Chanel No. 5 into a symbol of everything that had been lost and everything those soldiers and their girls at home, all those nurses on the front lines, hoped still might be saved. It was a part of a world before the war, a world of glamour and beauty that somehow had survived. It became the ultimate symbol of France, part of what everyone was fighting for...It remained a luxury even as all other comforts of living vanished, and this status as a luxury — as something untouched by this era of losses — was part of the magic and the desire. It’s interesting to me that Mazzeo used Andy Warhol’s silk-screen rendition of the Chanel No. 5 bottle for her cover. Chanel No. 5 is, in many ways, the inverse of Coca-Cola. Both items, high and low, were/are available to the average Joe. (Not only was Chanel No. 5 available to soldiers in military commissaries, Chanel No. 5 was available during the war in more affordable, smaller-sized flacons.) Ultimately,the secret of Chanel No. 5 lies in this irony: that a luxury product gained its icon status by being available to the average consumer. Hi, it was a fun read wasn't it? But in the end I felt disappointed. The book concludes on a note of pure ecstasy for Chanel No 5, the author's critical faculties having long been left behind. The early chapters are the best. After the Second World War the story gets thinner and duller. And not surprisingly, Chanel No 5 occupies centre stage for the entire book. Other great fragrances and fragrance houses get mentioned generally only in passing, and less and less often towards the end. And really, I'm not sure that the author really answers her own question - what is the 'secret' of No 5 that has made it such a dazzling success? - all that well. Mazzeo seems to conclude that the secret of No 5 is that 'so many of us wish to possess it'. It is 'our story'. Unless I'm missing something, that sounds to me like saying that the perfume is popular because it is popular. I would have loved a comparison with some of the great rivals to No 5 - Joy, Arpege (especially that one), L'Interdit even. Why did L'Interdit fade off the scene and not No 5? They were similar in style, quality and target market, after all. And I wanted a greater analysis of the new players in the field in the last decades of the c. 20 - Dior, Givenchy and YSL. That fact that No 5 is still a best seller when the market is now so atomised (1,000 new launches each year) is the story I wanted to hear, but it is at this point that the author loses her energy. Nor is there much mention of the different concentrations of No 5. Mazzeo remarks that the scent has hardly changed over the decades, but in a sense it has changed a lot. Was it the parfum that the GIs were buying in the Second World War, or the cologne (surely the latter)? When was the EDT introduced and the EDC phased out, and why? What was it about fragrance fashion in the 80s that led to the creation of the EDP, and in the noughties to Eau Premiere? The author must think these are mere technical questions for perfume geeks only, but surely they show how adeptly the makers of No 5 have been at re-inventing it. I did really like the Aubazine chapter, especially the bits you quote. It is very speculative, as you say, but it does bring to light a set of aesthetic influences that I had not heard of. I was fascinated by story the early development of No 5, and later, by the story that American soldiers in Chanel's boutique in Paris needed no French to buy what they wanted, just to hold up five fingers! Wonderful! I thought she did a good job explaining the perfume's success without reducing it to one thing: the secret was in fact SECRETS — its bottle, its formula, the almost occult number 5, the savvy business decisions Chanel's business partners made during the war, Ernest Beaux's fascinating blend of clean/dirty notes, but most of all for me, the parallel of Chanel's sad and aspirational back story with the perfume's availability to a similar aspirational consumer. I like that the secret of Chanel No. 5 in some ways remains a mystery. It's a fantasy object with enough blank spaces to project onto. And of course, it smells expensive and wonderful. I've never been particularly interested in reading about Coco Chanel until this book. I then came across another recently published book called Coco Chanel: The Legend and the Life. It's FULL to overflowing with illustrations, and it really augments and elaborates on things only touched on by Mazzeo. I loved the No.5 book. Reading this one, I'm fascinated by what Mazzeo might have added but left out. Chanel was, apparently, a massive dissembler. Keeping track of her various stories is a task, but its own form of detection. What I appreciate about The Legend and the Life is that, while it focuses to some degree on Chanel's stubborn self-sabotage at times, it also shows in detail how incredibly savvy and intelligent she was--not least in her observations and recollections about people. And it makes some of the connections between Chanel No. 5 and Coco's childhood, but more persuasively. I liked both books and think they make good companion pieces. Thanks for the review. I will have to check that other Chanel book out. Thanks for letting me know about it. The primary complaint I hear from people who've read the Mazzeo book is that so much was left out. It was a quick read, it's true, and very impressionistic.Chanel was quite a character; now I'm going to have to see the movie starring Audrey Tatou as well! Hi again, sorry I was rather harsh with my comments above. I think it was my disappointment - that the book started out so promisingly, but fizzed. Still, it is absolutely worth a read for Chanel lovers. Thanks for reviewing the book. Justine Picardie's 'Legend and the Life' has been on my must read list for some time and I hope to get to it early next year. It sounds from Brian's comments that it will have much more substance. I hope you enjoy the Tatou movie. It deals at length with a brief period of CC's life - her career as a show girl and her affair with Etienne Balsan - so do read up on that before you see it, or you might be puzzled. I saw it before I read Mazzeo on the significance of CC's impressions of Balsan's other mistress Emilienne - she of the warm skin and freshly washed hair. I'm wondering now if Emilienne is in the movie. Can't remember. People had strong reactions one way or the other to the book, Anne. No need to apologize! (I like strong opinions!) I actually can see how maddening some of it could be. Octavian on 1000Fragrances went so far as to call it a straight-up novel. To Anne, as far as I can tell (as a big fan and researcher of No. 5), the EDT was launched around 1964, replacing the cologne concentration of the time. Great review, btw. I actually have this book waiting for me to pick it up at my local library. I'm fairly excited to read it, but from what I am hearing, it's more of a linear narrative, rather than a reference guide to No. 5, which is sad. I too was hoping for more of a reference guide for Chanel fragrance lovers & collectors. I love this. Coco Chanel made full use of social mobility, so I'm sure she would too. Hi Joan. I agree! I think Chanel No. 5 retained, in some strange way, Coco Chanel's ability to move through society — upwards or "down market." really, more then anything, what turns Chanel No. 5 into an icon." And the Chanel bottle information is on pages 104-108. Glad you liked it, Robin, but it sounds like you echo what many people who are interested in the nitty-gritty concentrations/dates said: some of the facts are off, or at least, disputable. Thanks for giving us your mini-review. Your perspective is appreciated! @Anne There is a picture online or used on a Chanel video from the inside of the store and you can tell they are buying the parfum actually.